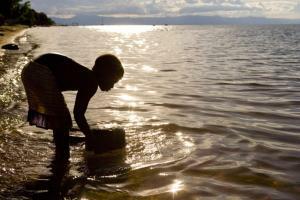 Welcome to the best fresh water beach in Africa! Muli Bwanje Alendo! Or, translating Malawi's ChiChewa language into English, "Welcome Travellers!" 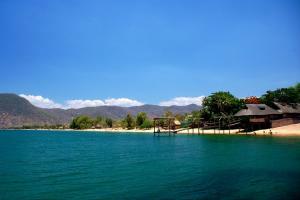 Cape Maclear is Malawi�s version of the Cote d�Azure or the beaches of Mykonos: a strip of honey-coloured sand lapped by turquoise water under a sunny, blue sky and fringed by an assortment of beachside bars and accommodation to suit every taste. But this is Africa � so the differences with the European beach vibe abound: here the beach strip is the interface of the local village (Chembe Village) with the lake and therefore some sections of the beach are busy fishing areas, others are places the local children love to play and still others are where the village ladies come down to the water�s edge to do the washing up from the night before, do their laundry and to have a swim themselves. But if all this sounds a bit too rustic, never fear: the lodges all keep a length of the beach in front of their establishments raked and manicured and scattered with loungers for the comfort of their first world guests. After years of experience we have some great ideas on how to get there and do it all. The focus, as always, is a mix of Cape Maclear beach action with some chilling in the camps on Mumbo Island and Domwe Island. 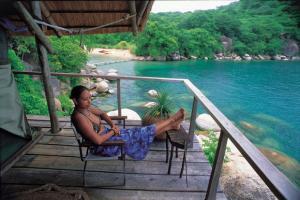 Hardly surprising, since these destinations are what Malawi is all about! Go to Great Deals to get you there for Kayak Africa's great fly-in packages which mix a few nights on the mainland with a few out on the islands. The meeting of two different cultures; the tourist and the villager, is a happy one and full of richness for those who want to experience a bit more than beach and water (though everyone is happy to let you do just that if that is what you need to restore your spirits � this is a forgiving and gentle place.) I love the interactions with people from the village � there is a tinge of colonial English in the speech and often one is greeted with the quaint, �You are most welcome,� which makes you feel welcome indeed. The craft vendors are unfailingly polite, if very eager to make a sale, and though sometimes they may be pushy, apart from the unusual bad egg, most are gentlemen. Malawi is a polite society, and quite traditional and conventional by western standards � there must certainly be a certain amount of head shaking at the antics of the holidaying tourists, but it�s a case of live and let live here at the lake�s edge.